These men are the hardy pioneers that set out to conquer America. Although driven primarily by greed, they exhibit exceptional bravery, cunning and resilience. 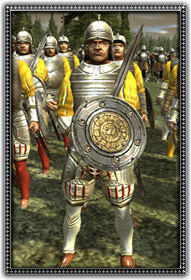 With their steel half plate armour, and razor sharp steel swords, these men are absolutely devastating against lesser troops. They can only be recruited in America.